Beautiful, newly built, 4 bedroom, 4.5 bathroom, lower story, sitting on the Strand in Oceanside, Ca. 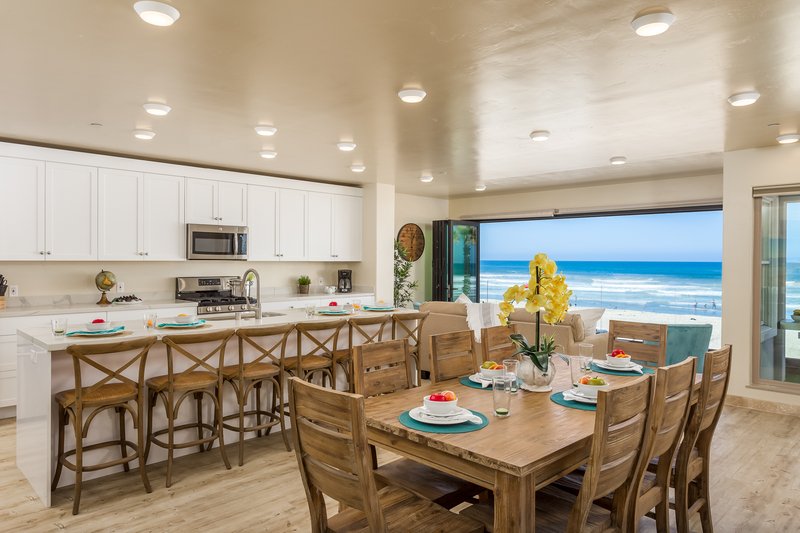 Walk a few steps out your front door and you are on a wide sandy beach with picnic tables, barbecues, and the Oceanside Pier, all right in front of you. This unit features a 2 car garage. Overflow parking is available at our office in Oceanside, located at 1640 Oceanside Blvd, Oceanside, CA 92054. 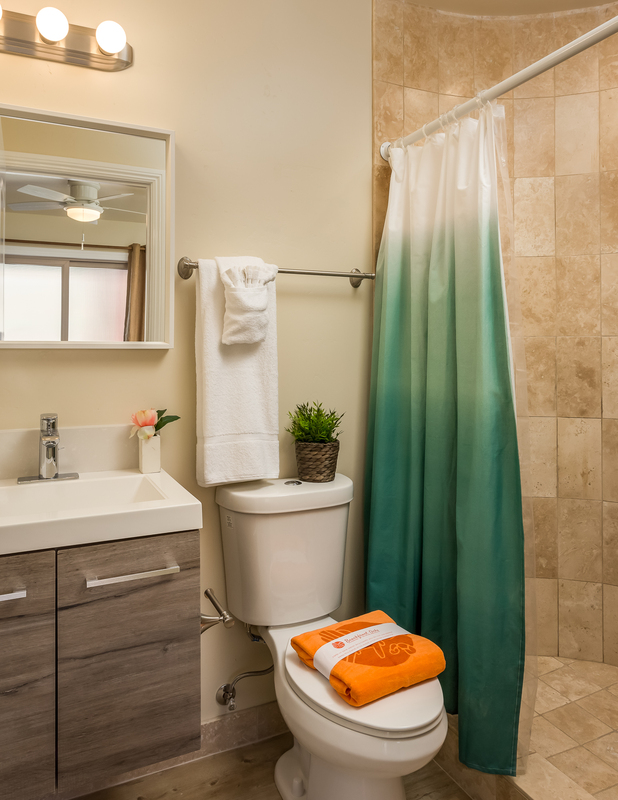 This home is fully furnished and professionally decorated. 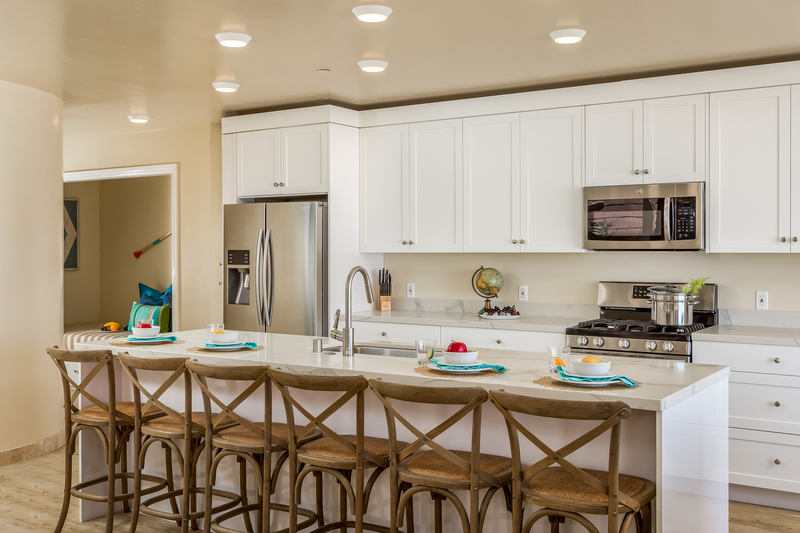 Kitchen has all amenities you could imagine, with ocean views and granite counters. 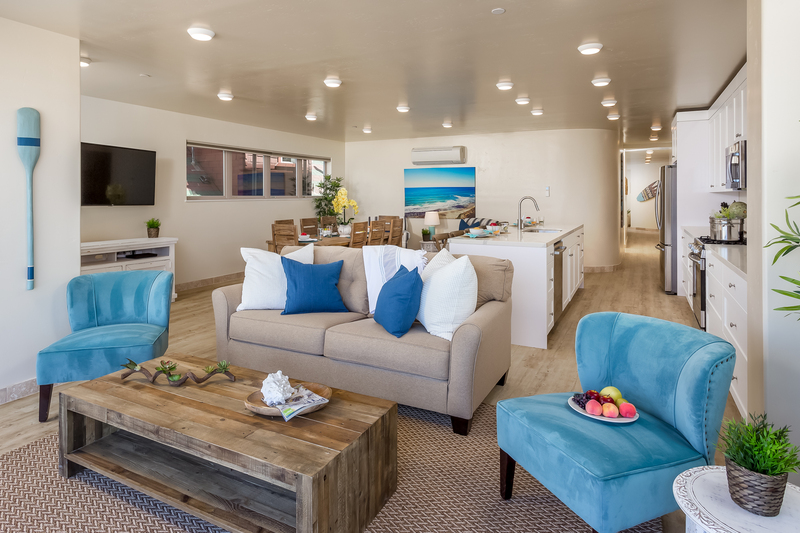 The living room looks straight out to the ocean with AMAZING panoramic doors that open to your private deck, and 2 of the bedrooms also have ocean views. 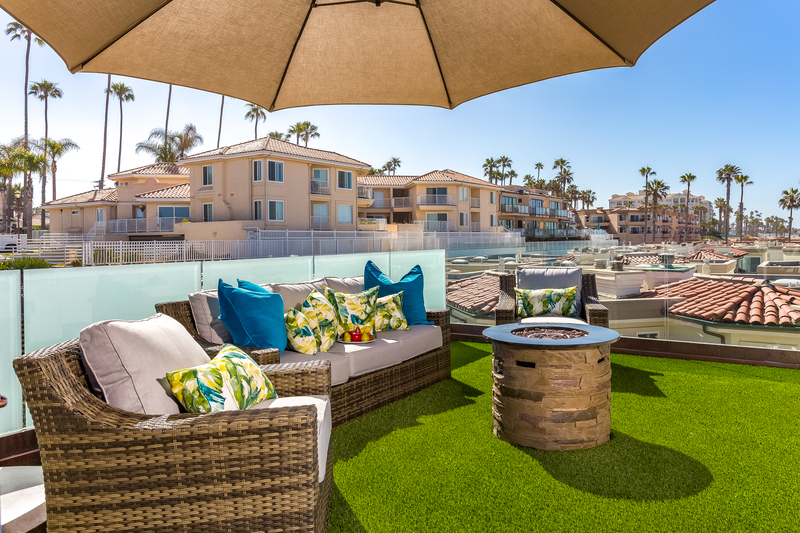 Enjoy your own patio area looking straight out to the beach! 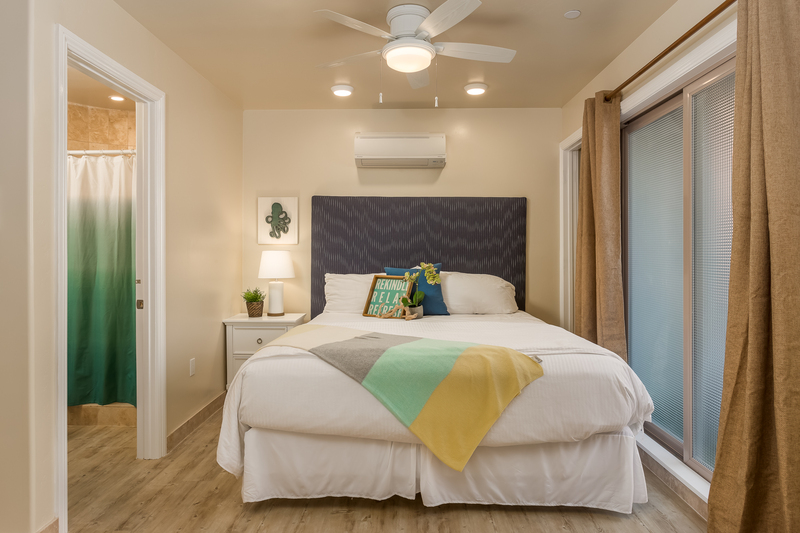 Your comfort during your stay is very important to us- that's why we've stocked this home with plenty of conveniences you may need during your stay. 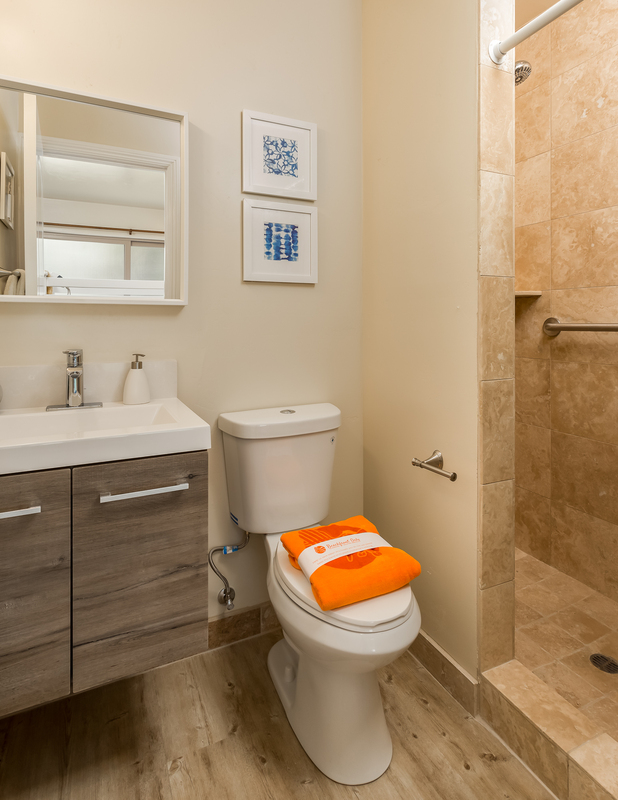 Each room boasts comfortable, clean furniture and is professionally decorated. 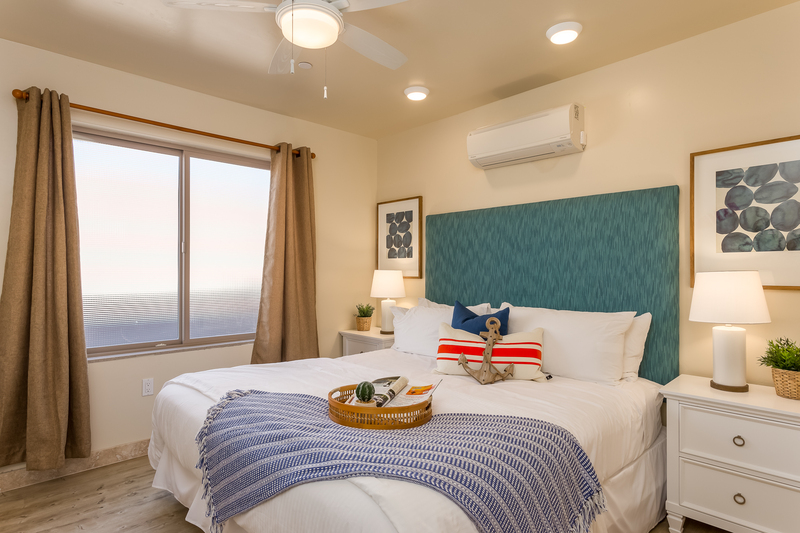 You'll find linens, beach towels - even spices and cooking gadgets are provided, so you'll have everything you need at your fingertips. Make your next vacation a beachfront experience. The memories you create with family and friends will last a lifetime! Check out some of these first-hand accounts from other guests who have spent time at our beachfront vacation rentals, or view some of their photos! BEACH ACCESS: Beach access is out the front door and across The Strand, straight onto the sand. The Strand is a single lane 15mph access way for the properties along this road, and is pedestrian friendly. The Strand is not a thoroughfare, and there is no parking on The Strand. 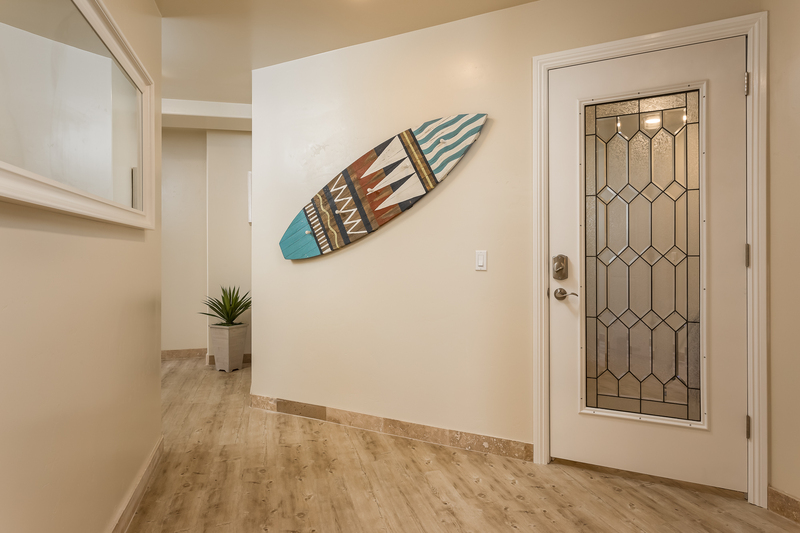 Learn more about Beachfront Only! My wife and I are local, this was our second time using Beachfront Only for a local weekend escape while my sister watched our kids. We had some friends join us, now they want to book a family reunion. Parking is great, unit well kept, views are amazing and there is a restaurant nearby that makes some top notch calamari. This rental was suitable for our family vacation. The location of the rental was good and it had the basics stocked upon arrival. The pictures are definitely deceiving as it’s not quite as nice as it portrays (both the unit and the view). The WiFi signal was weak and the one television didn’t work properly until the last day of our trip. Beachfront Only is a pleasure to deal with; very responsive to questions and concerns. The property was beautiful and very comfortable for our family. It was fantastic to be right across the way from the beach. Beyond expectations, re-started a family tradition. The surfers surfed, the little ones dug in the sand and learned to bodysurf, all under the watchful eyes if parents, grandparents. Every thing was close enough to not be inconvenient but far enough away to allow quiet evenings. Definitely planning our next visit. Over all it was a great experience would recommend it to anybody I will try to be back next year. Our family spent fall break at this location and loved every minute of it! We had two families together, 13 total people. There are enough beds to sleep 13 however one down side is that two king beds share one of the rooms. Two bathrooms are from that one bedroom. This is the only downside of the property. We loved everything else. In great condition. We stayed here for the weekend and truly enjoyed our experience from the reservation process to the condition of the house. It is so clean and convenient. We will definitely be back. This property is really good Home Getaway with great location amenities.We felt sitting furniture is inadequate and that too with wood dining chairs are not comfortable and there was no outdoor furniture. My family and I loved...loved staying at the Beachfront Condo...loved the Bi-folding doors facing the ocean. I was only a little disappointed that we did not get S207-2 which has the corner view of the ocean and pier. I will make sure to request that in the future. I definitely would consider staying there again though. It was peaceful, kitchen well equipped and very clean. Well worth the amount we spent for the days we stayed there. Thank you. This condo is a dream come true! The location is absolutely perfect. 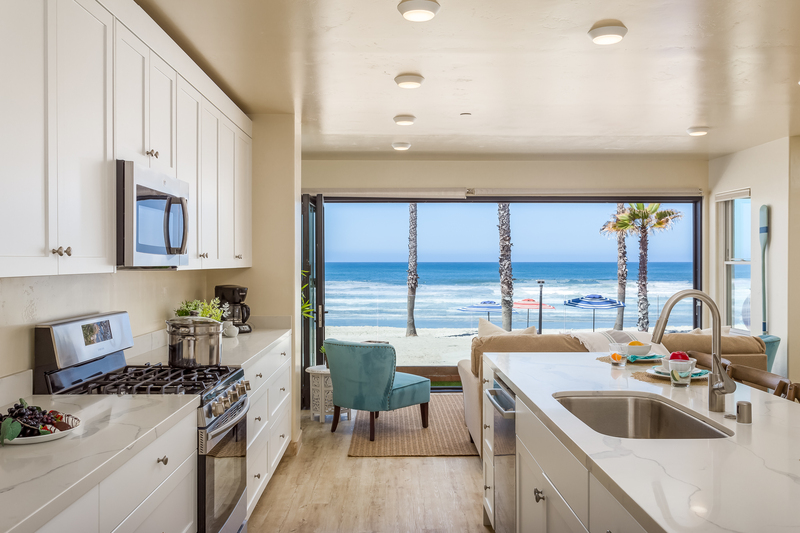 Great beach access, waves, view, and amenities; the list could go on and on. The condo itself is absolutely gorgeous and the configuration of the bedrooms, bathrooms and living area is awesome. Our family wants to make this a yearly vacation spot. The only small issue we had was the air conditioner didn’t work in the main living area the first night, but was quickly repaired. 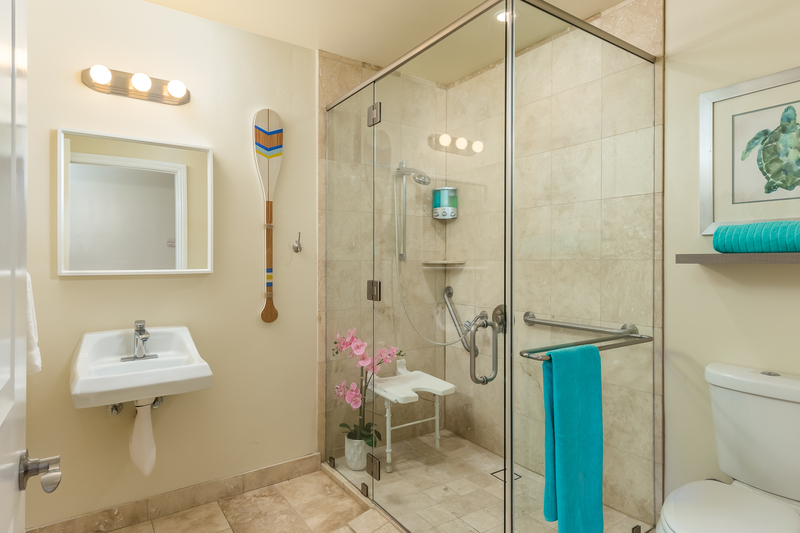 Also an outdoor shower would be much better than the plastic tubs they provided for your feet as you entered the condo. Dear Diana, We are so glad we could make your dreams a reality! We hope that you do make it a yearly tradition to spend some time together and if it is at our property it would be a double win! We are glad that we could help with the air conditioner during your stay, we are just a call away. Thanks for the outdoor shower idea, we will bring that up with the owners. Thanks from all of us here at Beachfront Only! Great stay, with a great view. Property is fantastic. We loved the vacation. The property is an A+. The facility was fantastic. Beachfront organization was very helpful with all of our needs. The only issue was the re-cycling of the elevator. Loud. Needs to be looked into. But when we used the elevator to take all of our stuff out of the unit, that was very helpful. The front room and kitchen were fantastic. All modern appliances. Views were the bomb. It was a perfect place from beginning to end! Perfect for our celebration weekend! The unit was amazing and the location was perfect. The beach in front of the unit was completely swimmable. The property management was responsive to our issues and I can't say enough about how wonderful our experience was. A long weekend on the beach. Incredible views easy walkable area! We were a family of 6 and it worked well. 13 would be pushing it in my opinion but there are 13 spots to sleep if needed. The retractable doors opens the condo to the outside. Our stay was a fantastic one. The beach house had exceeded my expectations. A new house with extraordinary beach views. The only challenge was the tight parking and the noise coming from the top unit. No big deal. I will certainly be going back and requesting the same house. My family had an epic time!